I observed the Cambridge Cycling Campaign AGM on Tuesday the 1st of November 2011. 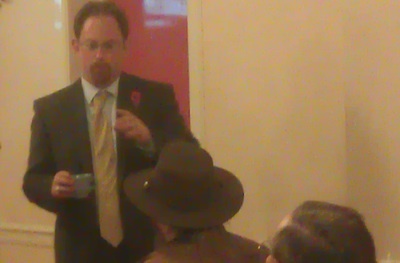 Cambridge MP Julian Huppert was the guest speaker. The 1082 member campaign has been re-organised at the top. Martin Lucas-Smith, who previously led the organisation with the title “co-ordinator” was elected “chair”, the new top-job in the campaign, unopposed. Michael Cahn took over as “co-ordinator”, and a new post of “planning co-ordinator” was also filled. Julian Huppert gave an excellent speech, which was followed by questions from the floor on a broad range of cycling related subjects. Julian Huppert reported he expected the provision of 200 new cycle parking spaces at Cambridge Station “very soon”. Julian Huppert wants to see a national road pricing scheme, moving the taxation of driving from being based on a fuel tax, to being based on a congestion tax. Julian Huppert isn’t particularly opposed to raising the motorway speed limit to 80MPH; though he doesn’t like the fact ACPO Ltd. a private unaccountable company, set what he called the “operative speed limits” in the UK. Mr Huppert arrived and had trouble finding somewhere to park his bike outside the Friends Meeting House on Jesus Lane. The cycle parking outside was full (as well as the cycling campaign meeting there was also something on at the ADC Theatre). The stands are badly laid out, so it is hard to get bikes to those in the middle of the array. I think Mr Huppert parked his bike, locking it only to itsself; a risky approach in central Cambridge. I hope it was there when he got back. A member of the campaign, and the Cambridge News, photographed Mr Huppert’s struggle to find somewhere to park. A tweet from the News’ Raymond Brown reporting the occurrence somehow gained Twitter “Top Tweet” status. Huppert started his speech by saying he had been a member of the campaign for some time and had previously addressed the AGM when he had been the chair of the local Traffic Area Joint Committee. Mr Huppert said that the Cycling Campaign was a fantastic organisation and in his experience on the T-AJC its representations were often of higher quality, and better backed up, than reports by council officers. Julian extolled the benefits of cycling, including the public health benefits which he thinks ought be focused on more. He said cycling is a form of transport which lets you easily meet and talk to people. Huppert said he has three bikes, a local bike, a long distance bike and a London bike. He spoke about various other MP’s attitude to cycling, many other MPs do cycle, there are cycle racks for MPs in Parliament and some would like to see a Boris bike station there too. Julian explained some of his many roles as an MP, including as a co-chair of the All-Party Parliamentary Cycling Group. After going through the complex criteria a group must meet to allow it to be called an All-Parth Parliamentary Group, in terms of number of members and representation from different parties, he extended an invitation to everyone to come along to the various events the group runs, and explained how they could be good opportunities for getting a chance to lobby ministers. Huppert is also the Liberal Democrat Transport Spokesman; one is needed he told the meeting as the Liberal Democrats don’t always agree with Government policy. This role explains why Huppert makes speeches on coastguards and lighthouses. He said the position gives him extra access to ministers which he used to raise constituency related matters such as the proposed Chesterton Station. Huppert explained how he uses various methods to push cycling issues in Parliament, including asking written and oral questions. Huppert described an adjournment debate as “a way to make a minister speak on a subject” and said how he had used his opportunity to set the subject for an adjournment debate to raise the subject of cycling. Transcript of Huppert’s “Cycling in England” Adjournment debate. it is safe, healthy, cheap, convenient, fast, reliable, clean and green. Huppert noted the irony of arguing cycling was safe while standing up in Parliament in a sling after he had broken his arm in a bike accident. Huppert explained he went down a hill too fast. [He was in Australia on holiday visiting his brother at the time]. Huppert said that “cycling all in black, with no lights, and cycling in-front of cars isn’t safe”, but said cycling generally was safe, contrary to the views of many. Addressing some other misconceptions surrounding cycling, Huppert said it wasn’t the preserve of eccentrics or those who couldn’t afford a car. He noted Cambridge was different from elsewhere in the country, for example here the idea you can cycle while dressed in a suit is accepted. Huppert explained he chose the subject of his adjournment debate as “Cycling in England” as he opposed, and lamented, the abolition of “Cycling England” the independent expert body that advised on the promotion of cycling. In terms of improving safety, Huppert spoke about reviewing sentencing for drivers injuring cyclists. I thought he was very careful what he said here, and notably he didn’t express support for the idea of presuming the driver of the motor-vehicle is guilty in such cases. The cycling campaign tweeted to say Huppert expressed support for “proportionate liability”. I’m not sure he did, but I might not have noted it as the phrase isn’t one which I understood, before looking it up while writing this article. Strict or stricter liability has also been referred to as ‘proportional liability’: this recognises that the liability (and duty of care) of one’s actions when using a road should be proportional to the degree of danger which you impose on other road users. Hence motor vehicle drivers would always have a greater duty of care to people who are vulnerable on the roads when walking or cycling. That appears to be common sense to me. But there are other sources which define “strict liability” as : “in an accident with a cyclist, the motorist is presumed to be at fault”; a stance which sounds unreasonable to me. Huppert said he was campaigning to get more about cycling in the driving test, especially for HGVs and said driver training for the Olympics had involved drivers of large vehicles getting on bikes and experiencing what it is like to ride alongside them. Huppert reported he’d asked if the Government had plans to make cycle helmets compulsory and Mike Penning MP (The Parliamentary Under-Secretary of State for Transport) had replied, succinctly: “No”. Huppert said Cambridgeshire County Council doesn’t spend enough on cycling. He was also asked to comment on London, in response he said Transport for London thinks its great, but it really isn’t. Huppert related how he’d signed up for a Boris bike key once but it was never delivered, he said more recently he had tried again but the system had rejected his card. Huppert praised the Cycling Campaign for running its election questionnaires and helping people hold those elected to be councillors to promises made during their election campaign. I’m not quite sure from my recollection when event turned from a speech by Julian Huppert into a question and answer session; perhaps it rather rolled from one into the other. A campaign member said that construction lorries working on Crossrail had to have a certain type of mirror, the design which is best for seeing cyclists. Huppert was asked if Cambridge City Council could require delivery trucks, and those involved in the construction of new developments in the city, to have decent modern mirrors (to help them see cyclists). Huppert wasn’t able to answer the question itsself (it’s one for the City Council – perhaps if it can’t do it by law it could become an element of its considerate contractor’s scheme?). Huppert did note that each new mirror design on a truck needs ministerial approval in the UK and described that as “bonkers”. I asked if Huppert had a driving licence, and if he drove. He replied to say he had a licence, but no car. He said he used “ZipCars” a car hire / share company when he needed to. He said that for carrying bulky items, and for travel to rural areas a car was sometimes needed. Huppert appeared to guess why I was asking the question and added that while one might like transport ministers to have experience of all forms of transport, it might be rather expensive and impractical for them to get pilots licences. In response to a question Huppert said he had had various meetings with national express and was hoping for 200 more spaces at the station very soon. Asked if he had met Taxi Drivers and the Jeremy Clarkson fan club, Huppert said he did often speak to taxi drivers at the rank at the station. He said some were pro-cycling, and wanted people to cycle rather than use a taxi for short journeys. Asked how secure Bikeability‘s funding was Huppert said it will be fine, noting it was a relatively small amount of money. He said a minister had undergone Bikeability training. Bikeability is something I personally don’t understand the support for. I’m worried that we’ve got a minister who needs such remedial training. I want to see high quality cycle and road safety training in schools but I can’t see why it can’t be delivered by teachers. To me this whole scheme looks like the creation of lots of public sector non-jobs. I realise some adults might want cycle training; but don’t see why that ought be state subsidised. Huppert said that what matters is the enforced limit and not the speed limit. He said there might be some kind of trade off between a default 20mph limit for residential roads and raising the motorway speed limit; though it isn’t as direct a trade off as that. Huppert said it was wrong that the unaccountable ACPO limited, a private company, only just about to become subject to FOI, got to decide what the “operative speed limit” is in the UK. Huppert said there was no real argument against an “80 means 80″ approach, as that would not really amount to a change from the current situation where enforcement doesn’t start until 79 MPH. Huppert said there are environmental considerations too, higher speeds lead to higher carbon emissions. Speed limits on rural roads, and conditions for rural cyclists were discussed. Huppert said he would give the issue some thought; he argued against any blanket adjustments to national speed limits, given the huge diversity of roads in question. Huppert was asked his view; he said the local scheme proposed for Cambridge was unworkable, and set up to fail. He said he supported national, not local road pricing and wanted to move away from taxing fuel to taxing based on congestion. He proposed a revenue neutral approach. After the event I obtained an assurance from Julian Huppert that he is concerned about the liberty and privacy implications of a national road charging scheme. My own view is they will be very hard to surmount. A questioner noted that she hadn’t paid anything to travel by bike to the meeting, with no fuel or parking charges. She suggested this made cycling bad for GDP. “Sssh don’t tell the Treasury” joked Huppert. This let Huppert explain his proposal that happiness and not GDP is used as a measure of economic success. He said that as “smashing up this room and getting it repaired”, having an oil spill and clearing it up, and even car accidents contributed to GDP it was a flawed measure. I think this argument is a bit silly in that GDP is simply something it is possible to calculate. The problem isn’t with the statistic, it is with how it is used. It is a statistic, it can be calculated (to some degree of accuracy) the only problem comes is when it is misused, or misunderstood. I think the underlying premise of the argument “against GDP” – that Government policies are designed to increase GDP irrespective of other factors is false. No government actively promotes smashing up meeting rooms or spilling oil as a way to boost the economy. A member of the campaign complained that Mr Huppert wasn’t talking much like a politician! Huppert was asked what he wanted from the campaign ie. what the campaign could do to support his work. My own view is Huppert was talking rather like a politician in some ways; I thought he was very careful with his words, much more so than he was before he was elected. Huppert reported that ministers were no longer going to have to approve each use of signs such as no entry except for bikes. This is to come in in a couple of years. Questions were raised about how much local councils will use the new flexibility and if they will be deterred, eg. by liability if their signage is judged misleading and contributes to an accident. Asked if he’d changed his view on the busway, Huppert said no, he still thinks it’s too expensive. Especially noting the price has gone up. He accepted it was useful to some people, and wasn’t calling for it to be torn up. Asked if he liked the cycle way – he said yes – but noted it was a very expensive way to get a cycleway built!. Raymond Brown of the Cambridge News asked Huppert if he claimed his London bike on expenses, or claimed any cycling expenses. Huppert said he didn’t; joking he was mindful of the newspaper coverage which might follow. Huppert said he might consider claiming such expenses though, as it was important they were available. Huppert noted the MPs expenses system was crazy; explaining that at one point MPs were expected to retain their train tickets. When Huppert explained the turnstile ate his ticket when he left the station he was told by IPSA that he ought ask station staff to open the barrier machine and retrieve the ticket so it could be submitted with the expense claim. The AGM for the Cycling Campaign followed. Julian Huppert is a member of the campaign. He participated in this part of the meeting too, voting for new committee members and voting to pass the accounts. Cycling is key to enabling the expansion of Cambridge via the new proposed developments. My comment on the cycling campaign’s objection to Sainsbury’s on Mill Road got a mention in the co-ordinator’s report. I’d said the campaign had systematically destroyed arguments put forward by Sainsbury’s in favour of their proposals. Martin Lucas Smith urged people to sign up to the FixMyTransport campaign for more cycle parking at Cambridge Station. Notable points from the various committee reports included that some members were leaving the city as they couldn’t afford to live here. I think that is very worrying and highlights how serious a problem housing prices are in Cambridge. The 100th Newsletter is due out in Feb/March 2012, and the campaign is looking for great images of cycling to illustrate it. The campaign are to invite the Duke and Duchess of Cambridge on their next Reach Ride. The new chair, Martin Lucas-Smith, joked (I think) asking for anyone with royal connections to get in touch. One of many good ideas discussed after the meeting was instead of minor speeding being treated as a criminal matter and people risking loosing their licences for speeding at 34MPH in a 30 limit a few times, minor speeding ought be dealt with by means of a tax; ie. you ought get a bill annually or quarterly, penalising you for minor speeding. This would deter without the criminalisation, which may be disproportionate. Such a system might ease the introduction of, and “enforcement” of more 20MPH limits. This entry was tagged Civil Liberties, Cycling, Julian Huppert, Taxation, Transport on November 2, 2011 by Richard Taylor. I think Cambridge City Councillor Colin Rosenstiel (Liberal Democrat, Market) was the only elected councillor present. Usually there are a few more than that at Cycling Campaign meetings. Bikeability training is so good because the instructors are required to be regular cyclists themselves and to have done the four day training course. A Bikeability course equips trainees for actually going out on the bike on a road. The problem with the old cycling proficiency was that it had become rather a tick box exercise: helmet Tick, hi-viz Tick, ride in the gutter Tick and was delivered by volunteers some of who were great but by others who hadn’t been on a bike themselves for years. I also used to think that adults didn’t need cycle training, but having gone through the instructors course and having worked with adults and students in Cambridge over several years I think that it is fundamental to the agenda of getting more people on bikes. Cycle training for primary schools has been offered for many years through the County Council’s Safer Cycling programme, in which local volunteers are trained up by the County Safer Cycling Team to deliver training to Year Six pupils. There has been no cost to schools. Often the volunteers are school teachers themselves. During the years of government funding for Cambridge Cycling Town, an additional option of ‘Bikeability’ training has been available for schools in Cambridge and within the six mile radius of Cambridge Cycling Town. Bikeability is professionally run and involves a higher standard of training. Now, Bikeability is available to all primary schools in Cambridgeshire, and full funding is available from central government. At the start of this school year, primary schools have received a letter from the County Council offering two types of cycle training for Year Six pupils – Safer Cycling, and Bikeability, both at a cost of £15 per head. Schools have said they find the letter confusing and inadequate because: 1) the basis for the charge is unclear 2) the distinctions and advantages of the two types of training are unclear and 3) schools cannot afford the cost of £15 per head and may not take up either option. Can the Cabinet member explain the charging system and why Bikeability training, fully funded by government, is being offered with a charge payable to County Council? I am pleased to provide further information, which I hope will clarify the County Council’s plans for the future delivery of child cycle training services in Cambridgeshire schools from September 2011. For over 30 years, the Cambridgeshire County Council has successfully funded and delivered, free of charge, its own cycle training scheme Safer Cycling to the county’s 10/11 years olds. Approximately 4,000 primary school pupils are trained each year by an army of local volunteer instructors, e.g. parents, school staff, etc. This is the single, determining factor in the success of Cambridgeshire’s cycle training scheme, compared to other schemes. (b)	the advent of the Bikeability national standards training scheme and the opportunity provided by the Cambridge Cycling Demonstration Town (CDT) project, for the Council to trial free Bikeability training, in the city schools, funded by the Department for Transport (DfT) Bikeability Grant. This has now been successfully delivered in the CDT area schools, at similar levels of training to that in the Safer Cycling scheme, which has continued in the remainder of the county. Since 2009, increasing budget pressures have meant that the Council now has to offset some of its operational costs, including those for the provision of cycle training, through income generation. As outlined in Cambridgeshire County Council’s Integrated Plan 2011 – 2014, child cycle training has to be deliverable at a neutral cost to the Council, within the next couple of years. We are currently in a transitional period working towards this. For now, the Road Safety Service has a base budget for staff costs, but this will be phased out, as part of this process. Despite the funding challenges, the Council remains committed to maintaining access to child cycle training in all Primary schools. In recognition of the success of both the Bikeability and the Safer Cycling schemes, we are now offering schools the option of participating in either scheme. The funds required to achieve this will be found from a combination of the introduction of small school training charge, (approximately £150 per school) reduced County Council budget and the DfT Bikeability Grant. Both training schemes will be charged at the same price, to contribute towards our administration costs. Training charges for all cycle training courses will be billed directly to the school, as a school activity. It will then be up to the individual schools to decide how much, if any, of the training charge they might wish/need to pass onto parents/guardians. Any potential individual pupil hardship issues will obviously be part of the school decision making process, which schools are best placed to make. Our proposed training charge is at the lower end of the range of charges, currently being levied by other authorities. Their experience has shown a short term reduction in participation of around 10-20%, following the introduction of charging, but that this recovered within 1-2 years. We will closely monitor the impact in Cambridgeshire and would hope to manage any negative effects accordingly. In time, we may well want to move towards ‘in-house’ delivery of ‘Bikeability’, which may allow us to reduce overall costs, in which case we would be able to reconsider the level of the training charge. The ‘Bikeability’ Grant is protected until 2015 by the current coalition Government. With no reassurance it will continue beyond then, the Council is working towards a cost effective way to deliver cycle training, should the grant cease. Our new approach means that schools are now able to choose which training scheme best suits their needs. We are currently consulting with schools to identify the exact demand for either cycle training scheme next academic year. I believe our new approach is the most viable way for the Council to sustain affordable child cycle training in the long term. Cllr Criswell does not appear to me to have answered the question about the differences between the two options though he appears to suggest the Bikeability “course” content is better given he says the council may want to move to providing “Bikeability” courses in-house. Is it still a “Bikeability” course if it’s delivered by a non-Bikeability trained teacher or volunteer using the materials provided on the Bikeability website? The question says teachers have been used as cycle training instructors in the past; Cllr Criswell appears to be suggesting this practice could be returned to. This wouldn’t cost millions, it’d just require the Bikeability website to be kept up. While I’m still open to the arguments the only thing I can see we’d lose is the what appears to be excessively formalised accreditation. I know Huppert said this is only a relatively small sum of money (£11m/year) but if we look after the tens of millions the billions will look after themselves. Bikeability is the brand name for cycle training to the National Standards (for cycle training). This requires accredited trainers who have completed a four-day course and been observed actually carrying out training to establish that they are competent to deliver training to the appropriate standard. Safer Cycling is a one day course which doesn’t require any time to be spent on a bike; indeed, to be a Safer Cycling instructor doesn’t require you to be able to ride a bike. The Safer Cycling scheme is monitored by County officers who are not themselves cyclists, and (I would argue) don’t have the competence to decide whether a trainer is delivering the training to an appropriate standard. Having been both a Safer Cycling instructor (for a school north of Cambridge) and a Bikeability instructor (in and around Cambridge), I can confidently say that the latter approach is likely to approve more competent cyclists, even in children aged 11. This is because Bikeability focusses on why as much as how, and aims to teach children a strategy rather than ticking a set of boxes. On the question of whether teachers can deliver Bikeability, I would say that if they had the training and qualification they could. But not all teachers cycle and so not all would be able to deliver the course; any more than someone who hasn’t learnt to drive is likely to be a competent driving instructor. I think Councillor Criswell’s comment about a small charge to schools of £150 is misleading; my understanding is that it will be £150 per group of children; hence the £15 per pupil, as group sizes are usually limited to 10 pupils per trainer. So for a school with 90 children the cost to the school is more likely to be £1350. There is also the question of whether the DfT will be happy with funds to support Bikeability training being diverted in to a lower standard of training. To ask the Secretary of State for Transport whether she has any plans to permit the installation of trixi traffic light safety mirrors by local authorities without the requirement to seek express permission from her. Cycle safety mirrors (“trixi mirrors”) must currently be authorised by the Secretary of State for Transport, Justine Greening, because they are not prescribed within the Traffic Signs Regulations and General Directions 2002 (TSRGD). Trixi mirrors were authorised initially at certain sites as part of a trial on Transport for London Cycle Superhighway. To further assist monitoring of their effectiveness, the authorisation is being applied across the whole Cycle Superhighway Network. Based on the outcome of the current trials, we will consider the suggestion my hon. Friend makes regarding trixi mirrors as part of this update, which is expected to conclude in 2014.